10 minThis guide provides guidance in the best practices of Vault implementations through use of a reference architecture. 10 minThis guide provides guidance on best practices for a production hardened deployment of HashiCorp Vault. 10 minThis guide will walk you through a simple Vault Highly Available (HA) cluster implementation. While this is not an exhaustive or prescriptive guide that can be used as a drop-in production example, it covers the basics enough to inform your own production setup. 5 minThis guide will walk you through a simple Vault Highly Available (HA) cluster implementation. While this is not an exhaustive or prescriptive guide that can be used as a drop-in production example, it covers the basics enough to inform your own production setup. 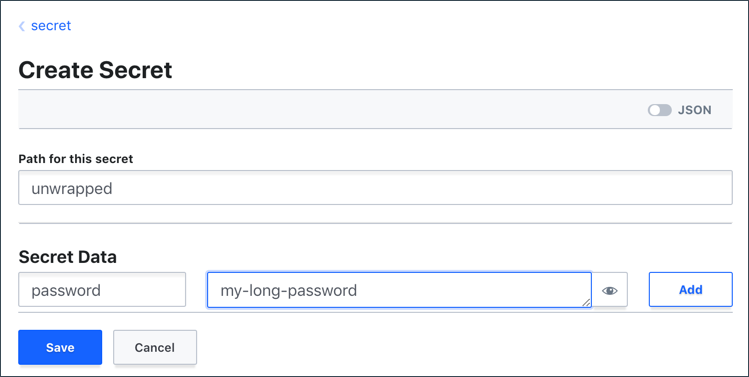 5 minIn this guide, we'll show an example of how to use Terraform to provision an instance that can utilize an encryption key from AWS Key Management Services to unseal Vault. 5 minThis guide demonstrates an example for enabling Auto-unseal with Azure Key Vault. 5 minThis guide demonstrates an example for enabling Auto-unseal with GCP Cloud KMS. 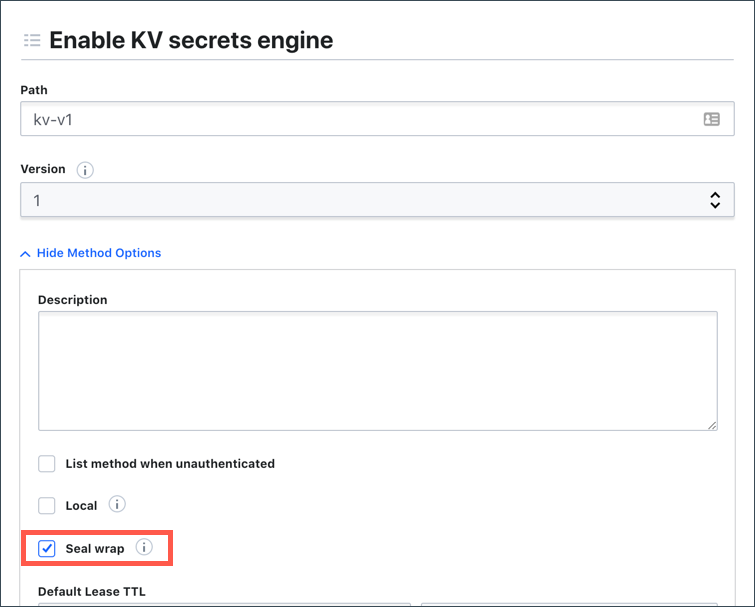 5 minThis guide demonstrates an example for enabling Auto-unseal with Vault's Transit Secrets Engine. 5 minGenerate a new root token using a threshold of unseal keys. 10 minVault supports generating new unseal keys as well as rotating the underlying encryption keys. This guide covers rekeying and rotating Vault's encryption keys. 10 minLearn how to set up and manage Vault Enterprise Performance Replication. 10 minThis guide demonstrates step-by-step instruction of setting up disaster recovery (DR) replication. 10 minThis guide demonstrates how to selectively filter out secret mounts from being replicated across datacenters with performance replication. 5 minLearn how to check the health of your Vault replication setup and troubleshoot if a problem occurs. 10 minThis guide demonstrates how Vault's seal wrap feature works to encrypt your secrets leveraging FIPS 140-2 certified HSM. 10 minPolicies provide a declarative way to grant or forbid access to certain paths and operations in Vault. This guide walks through policy creation workflows. 10 minVault Enterprise supports Sentinel to provide a rich set of access control functionality. This guide walks through the creation and use of role governing policies (RGPs) and endpoint governing policies (EGPs). 10 minVault Enterprise has support for Control Group Authorization which adds additional authorization factors to be required before satisfying a request. 10 minAuthentication is a process in Vault by which user or machine-supplied information is verified to create a token with a pre-configured policy. This guide demonstrates the use of OIDC auth method. 10 minThis guide provides guidance in creating a multi-tenant environment. 10 minThis guide walks you through how to monitor Vault with Consul as its storage backend. You will learn how to configure Vault and Consul to send telemetry to a monitoring agent, and which key metrics to pay attention. Enterprise Only: Vault's HSM auto-unseal and Seal Wrap features are a part of Vault Enterprise. In some large organizations, there is a fair amount of complexity in designating key officers, who might be available to unseal Vault installations as the most common pattern is to deploy Vault immutably. As such automating unseal using an HSM provides a simplified yet secure way of unsealing Vault nodes as they get deployed. Vault pulls its encrypted master key from storage and transit it through the HSM for decryption via PKCS #11 API. Once the master key is decrypted, Vault uses the master key to decrypt the encryption key to resume with Vault operations. The Federal Information Processing Standard (FIPS) 140-2 is a U.S. Government computer security standard used to accredit cryptography modules. If your product or service does not follow FIPS' security requirements, it may complicate your ability to operate with U.S. Government data. Aside from doing business with U.S. government, your organization may care about FIPS which approves various cryptographic ciphers for hashing, signature, key exchange, and encryption for security. Integrate Vault with FIPS 140-2 certified HSM and enable the Seal Wrap feature to protect your data. Vault encrypts secrets using 256-bit AES in GCM mode with a randomly generated nonce prior to writing them to its persistent storage. By enabling seal wrap, Vault wraps your secrets with an extra layer of encryption leveraging the HSM encryption and decryption. When a Vault server is started, it normally starts in a sealed state where a quorum of existing unseal keys is required to unseal it. By integrating Vault with HSM, your Vault server can be automatically unsealed by the trusted HSM key provider. To integrate your Vault Enterprise server with an HSM cluster, the configuration file must define the PKCS11 seal stanza providing necessary connection information. NOTE: For the purpose of this guide, the storage backend is set to the local file system (/tmp/vault) to make the verification step easy. IMPORTANT: Having Vault generate its own key is the easiest way to get up and running, but for security, Vault marks the key as non-exportable. If your HSM key backup strategy requires the key to be exportable, you should generate the key yourself. Refer to the key generation attributes. In another terminal, set the VAULT_ADDR environment variable, and initialize your Vault server. securely distribute the key shares printed above. There is only a single master key created which is encrypted by the HSM using PKCS #11, and then placed in the storage. When Vault needs to be unsealed, it grabs the HSM encrypted master key from the storage, round trips it through the HSM to decrypt the master key. NOTE: When Vault is initialized while using an HSM, rather than unseal keys being returned to the operator, recovery keys are returned. These are generated from an internal recovery key that is split via Shamir's Secret Sharing, similar to Vault's treatment of unseal keys when running without an HSM. Some Vault operations such as generation of a root token require these recovery keys. 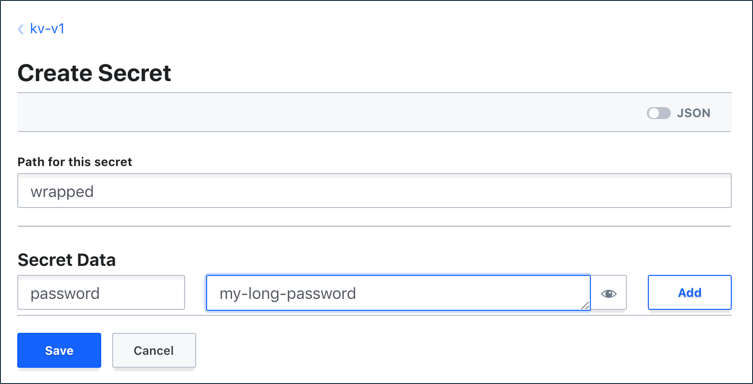 Login to the Vault using the generated root token to verify. The Sealed status is false which means that the Vault was automatically unsealed upon its start. You can proceed with Vault operations. NOTE: For FIPS 140-2 compliance, seal wrap requires FIPS 140-2 Certified HSM which is supported by Vault Enterprise Premium. For some values, seal wrapping is always enabled including the recovery key, any stored key shares, the master key, the keyring, and more. When working with the key/value secret engine, you can enable seal wrap to wrap all data. Check the enabled secret engines. Notice that the seal_wrap parameter is set to false. For the purpose of comparing seal wrapped data against unwrapped data, enable additional key/value secret engine at the kv-v1/ path. The above command enabled key/value version 1 with seal wrap feature enabled. Notice that the seal_wrap parameter is set to true at kv-v1/. Open a web browser and launch the Vault UI (e.g. http://127.0.0.1:8200/ui) and then login. Select KV from the list, and then click Next. Enter kv-v1 in the path field. Select Version 1 for KV version. Click Method Options to expand, and select the check box for Seal Wrap. Write a secret at secret/unwrapped. $ vault kv put secret/unwrapped password="my-long-password"
Write the same secret at kv-v1/wrapped. $ vault kv put kv-v1/wrapped password="my-long-password"
Using a valid token, you can write and read secrets the same way regardless of the seal wrap. Select secret and click Create secret. Enter unwrapped in the Path for this secret field, password in the secret key field, and my-long-password in the value field. Repeat the same step for kv-v1 to write the same secret at the kv-v1/wrapped path. Remember that the Vault server was configured to use the local file system (/tmp/vault) as its storage backend in this example. SSH into the machine where the Vault server is running, and check the stored values in the /tmp/vault directory. Under the /tmp/vault/logical directory, there are two sub-directories. One maps to secret/ and another maps to kv-v1/ although you cannot tell by the folder names. View the secret at rest. Secrets are encrypted regardless; however, the seal-wrapped value is significantly longer despite the fact that both values are the same, my-long-password. When Vault's Seal Wrap feature is used with a FIPS 140-2 certified HSM, Vault will store Critical Security Parameters (CSPs) in a manner that is compliant with KeyStorage and KeyTransit requirements.